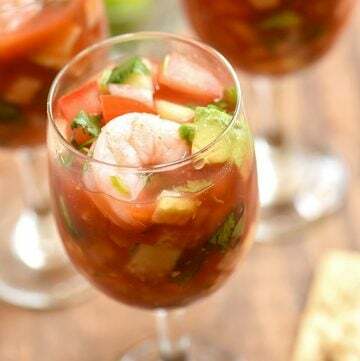 Coctel de Camarones with shrimp, tomatoes, onions, cucumber, cilantro, jalapenos in clam and tomato juice cocktail. 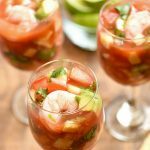 This Mexican Shrimp Cocktail is refreshing and seriously addicting! 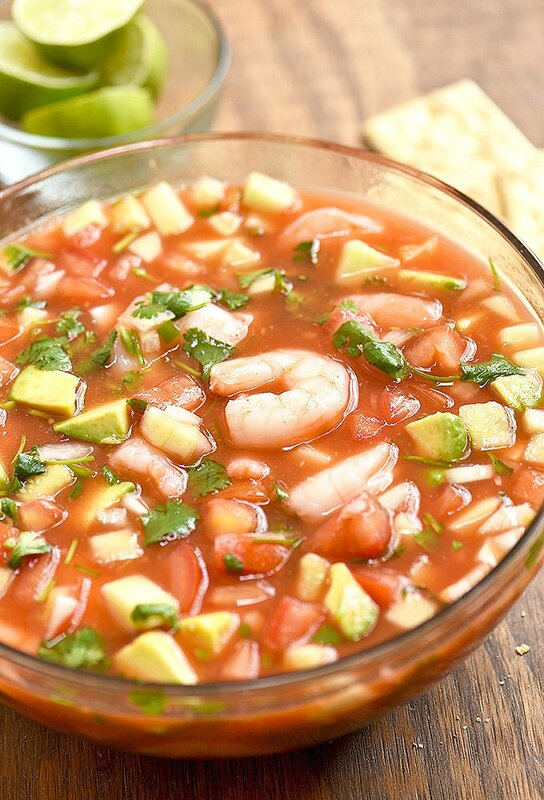 Serve with saltine crackers or tostadas for the best Mexican flavors! Coctel de Camarones is how I get through the oppressive California summer with sanity intact. When days get too hot and sweaty, I lounge by the pool with a cocktail glass full of this Mexican shrimp cocktail on the one hand and an icy cold Corona on the other. Sometimes, for real and most times, make-believe. Most of the work of prepping the shrimp is peeling and deveining but once that’s out of the way, they take only about 2 to 3 minutes to cook depending on size. 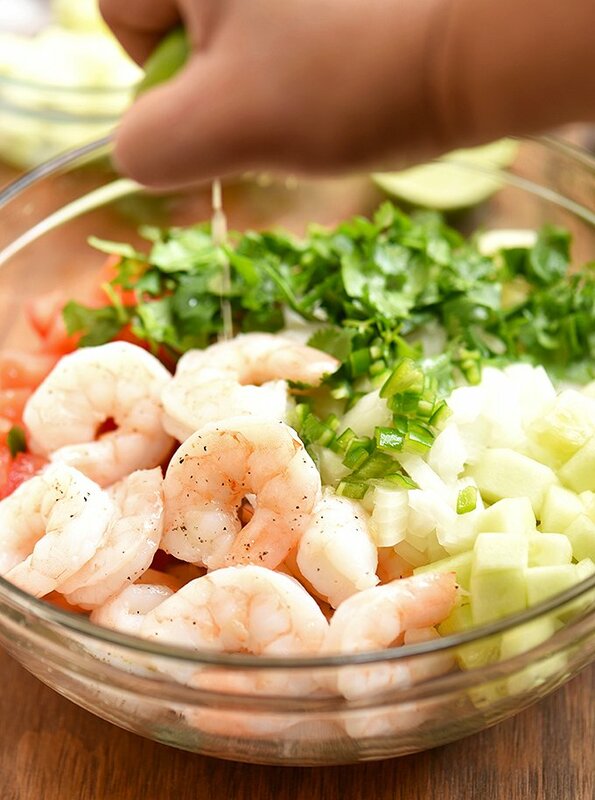 In a pot, bring about 4 quarts of water and 1 teaspoon of salt for every pound of shrimp. Add the shrimps and as soon as the color changes to pink, drain from the liquid. Place in a bowl and refrigerate to cool completely. Season with salt and pepper to taste. 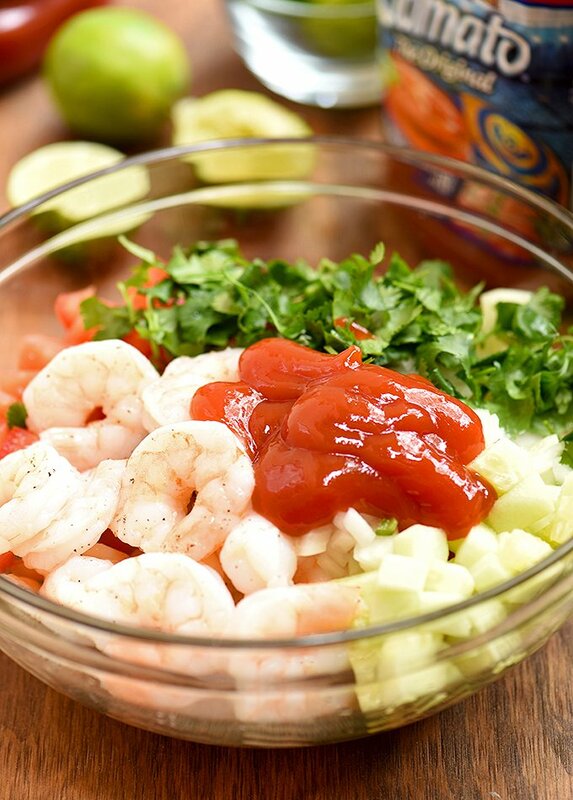 In a bowl, combine the shrimp and the prepared tomatoes, cucumber, onions, chili peppers, and cilantro. 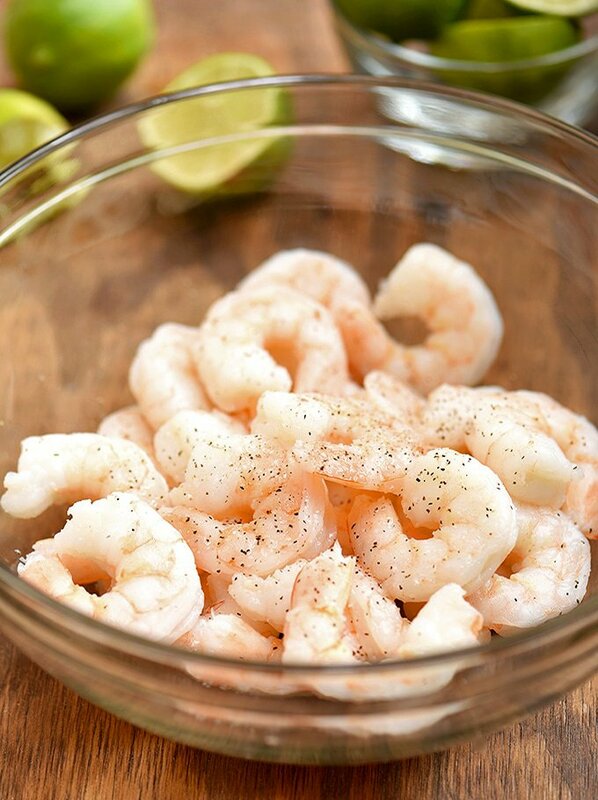 Squeeze lime juice on shrimp mixture. Add ketchup. Stir to combine. I used Clamato which is a commercial preparation made of tomato juice, clam broth, and spices for the caldo (cocktail juice) but you can substitute broth from poaching the shrimp or clam juice and vegetable juice. Along with the lime and vegetable juices, freshly-squeezed orange juice or orange-flavored soda is also commonly added for flavor. Add avocados, if desired. Adjust seasonings with salt and pepper to taste. Gently stir to combine. Refrigerate for about 10 to 15 minutes to allow flavors to meld. 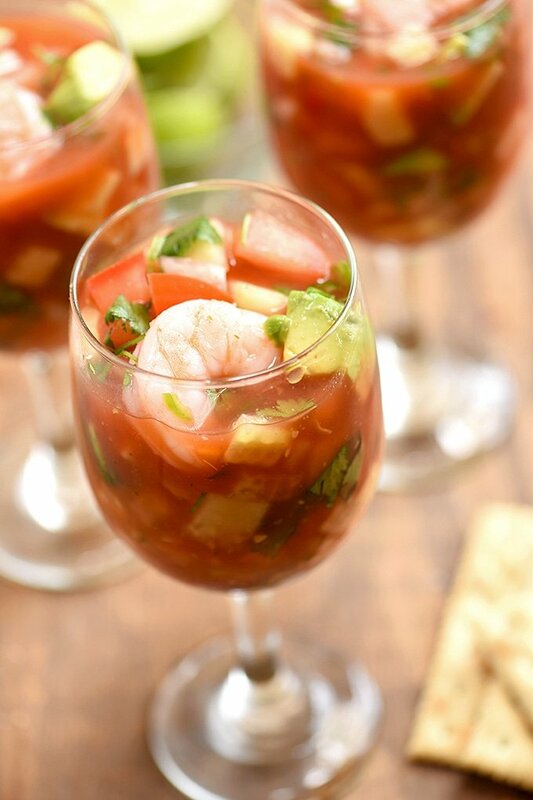 Ladle into cocktail glasses, garnish with diced avocados and serve with saltine crackers. 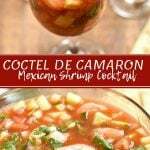 This coctel de camaron is very easy to prepare; you can have a huge batch ready in 30 minutes or less! It’s brimming with fresh yet bold flavors you’ll love all year long! Want more Mexican flavors in your life? This nopales salad is nutritious as it is delicious! In a pot over medium heat, bring salted water into a boil. Add shrimp and cook for about 2 to 3 minutes or just until color changes. Drain shrimp, reserving 1 cup of the poaching liquid. Chill shrimp and reserved stock in the refrigerator for about 1 hour. 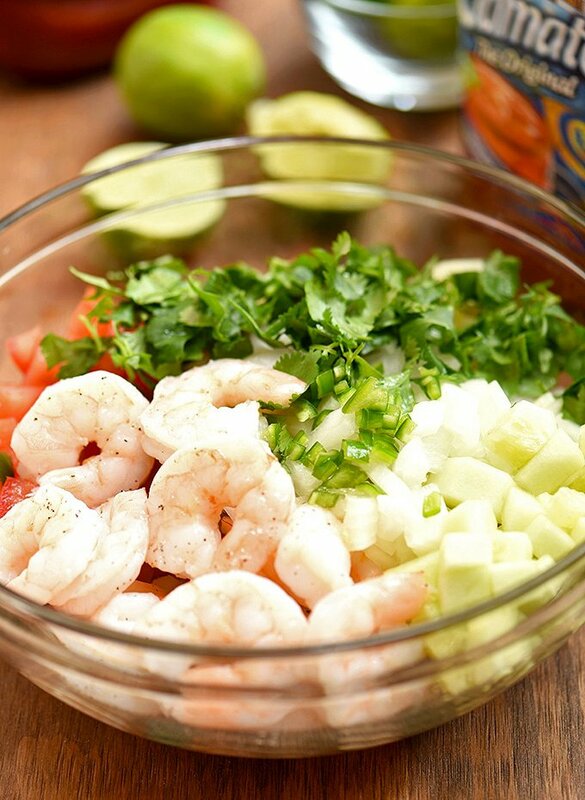 In a bowl, combine shrimp, tomatoes, onions, cucumber, jalapeno, and cilantro. Add lime juice. Add ketchup and stir to combine. 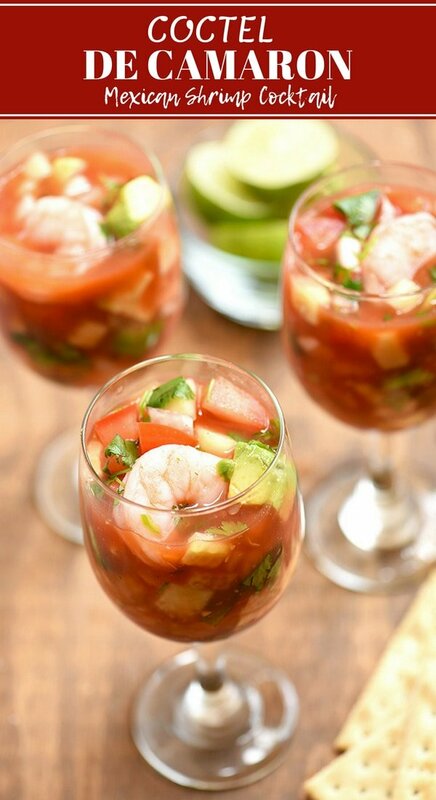 Add shrimp or clam juice and vegetable juice (or 2 cups Clamato juice). Add avocados. Season with salt to taste. Gently stir to combine. 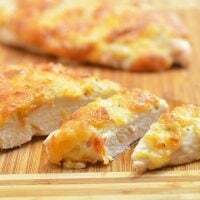 Refrigerate for about 10 to 15 minutes to allow flavors to meld. 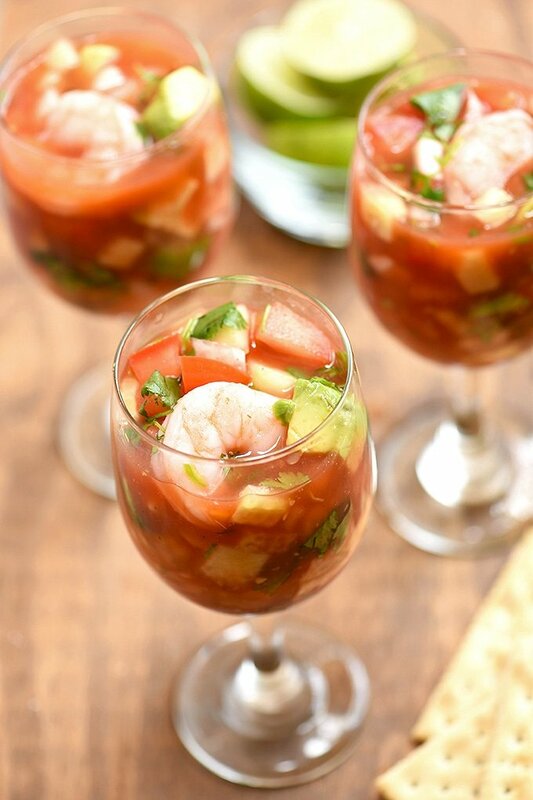 Divide into cocktail glasses and serve with saltine crackers or tostadas. 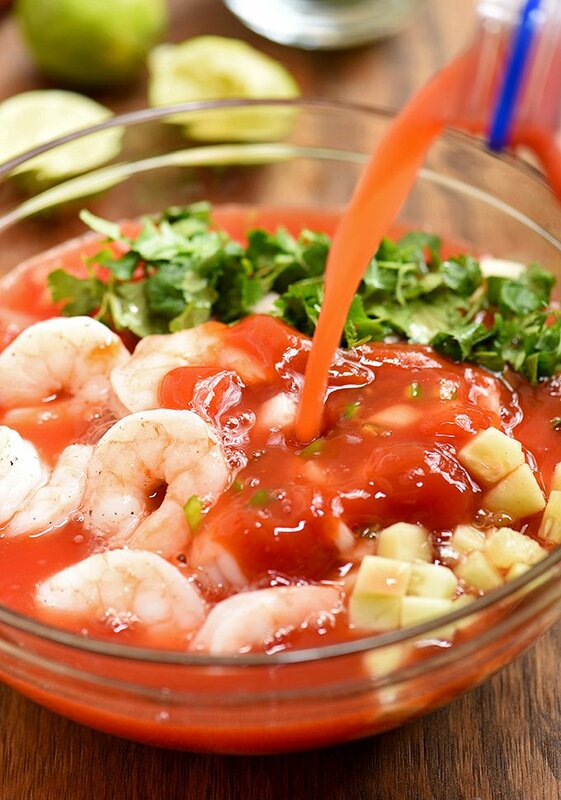 You can use 1 cup shrimp broth (from poaching the shrimp) and 1 cup vegetable juice or 2 cups Clamato juice. The classic way on the gulf coast around Veracruz is served in Sundae glasses with toasted saltine crackers. They layer the ingredients for visual effect. How interesting! I need to try that one of these days. Thanks for the tip! What a great idea for a summer appetizer . something different then all those shrimp cocktail glasses! I could probably eat the whole bowl though before positioning it into glasses ? Hahaha, yes, the cocktail glasses are just for pictures. I usually just eat it straight from the bowl ? Hi Lalaine! Recipe looks great! Where did you purchase that glassware? I have a customer who fell in love with them from your picture. This sounds so perfect. A bowl of this and some tortilla chips and you’ve got a meal.